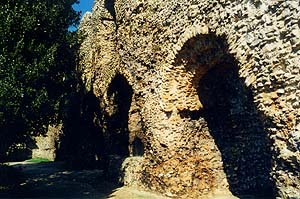 Very little of the great Abbey of Reading remains above ground and what does remain is a series of masses of flint rubble, which have been stripped of every bit of their stone facing. To get to them you pass through the Forbury Gardens and under a subway in the right-hand (south-east) corner. They are the local Council and are well cared for. All the four outer gateways of the precinct are gone, but the inner gateway survives, though in a much restored condition. It is a building of some interest. In the room over the gate, the "trial" of the last Abbot is said to have taken place. The church was 450 feet long and, except the eastern Lady Chapel, was a Norman building with an apsidal end. The transepts had each two apsidal chapels on the east; the innermost one on the south transept extended farther east than the rest. It may have been the old Lady Chapel. There was a central tower over the crossing. Fragments of the piers of this tower, and more considerable ones of the transepts, especially the south are all that survive of the church. Next to the south transept wall the vestry, or the slype, is traceable and then (going south), the chapter house, on the whole, the best preserved piece of all. It is apsidal and has its triple entrance and three great windows above. In it, no doubt, the Parliament sat, when, as not seldom happened, it met at Reading. Some modern bas-reliefs of the first Abbot being invested by the King and the last Abbot executed, and a facsimile of Sumer is icumen in, are on the walls. Next to it, going south, is a passage (possibly to the infirmary) and then the basement of the dorter, which extends beyond the cloister. The access from dorter to church must, it seems, here have been by way of the cloister. At the southern end, at right angles to the dorter, was the reredorter, under which ran the main drain communicating with the Kennet. The cloister garth is laid out in private gardens. The east corner and southern wall of the frater are traceable on the south side. As recorded, the stone facings have been completely stripped from the ruins and no decorative work left; yet we can gain some idea of the richness of the building from a visit to the Reading Museum. Here are a large number of very beautiful carved fragments of Norman date, notably a series of delightful capitals. These remains give a very high idea of the richness of the work in the Abbey church and cloistral buildings. Of institutions which depended on the Abbey, two were of special interest. The first is the Hospitium of St. John Baptist, founded by Abbot Hugh II between 1189 and 1193. It was connected with the Church of St. Lawrence, west of the Abbey, and had important buildings. Having gradually fallen out of use, it was, in 1485, converted to the use of a grammar school. Part of the dorter of the Hospitium still exists in St. Lawrence’s churchyard.